Users of Call of Duty: Black Ops have been seeing some notifications in the bottom left corner of their screens while playing multiplayer online, and it was talking about a bonus map for those who pre-ordered Black Ops 2. That map folks was Nuketown 2025. 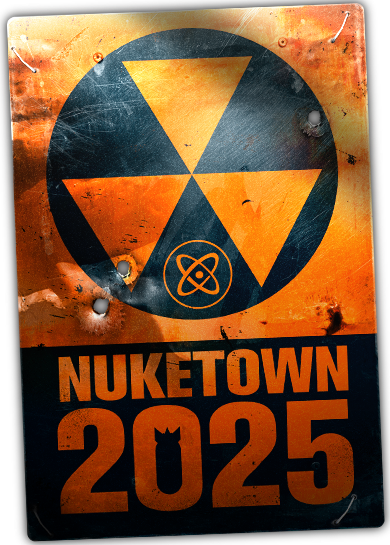 Once visiting this page as said on the multiplayer notification square, you get a link at the top of the page that says "Nuketown 2025." Clicking on that link will get you some info. I'm going to share some of it here today. First off, do you know how the Nuketown map came to be anyways? Well, lets start off with that. Nuketown takes place in a nuclear test site designed to simulate a typical American neighborhood. The map itself started out as an "unofficial" project for Level Designer Adam Hoggatt, who took the idea and had a working design up and running in only two days. It was quickly a favorite among the Black Ops developers. Nuketown was also special because it inspired creativity found in other Black Ops maps, such as the Zip Line in Kowloon and the Russian rocket launch in the map "Launch". Why exactly is it a favorite map? For most, it is the fast-paced action. Nuketown is so small, that you are bound to have very fast-paced action. On my personal experiences, (before I learned the hard way) I used to get blown up with Semtex (sticky) grenades within the first 2 seconds of the map starting. I also used to get Tomahawked as well. Helicopters in that map was an iffy situation. Occasionally, people are so good that they can reach at least 10 or 11 kills to get the Hind helicopter without dying. The sad part about this is the fact that it is a small map, and there is a lot of chances to get shot down in seconds. It is even easier for Huey's, since it goes around the map in a circle, and cannot move to evade lock on missiles, in combination with the helicopters flares. The FAQ for this map can be found here. Basically, if you buy the game now on pre-order, you will get the map as a download, because the map is not going to be on the disc. No word yet on getting the map after the game is released. Let me know of any thoughts below, be it the actual news or your experiences while playing the game.